Diary of a Parent Trainer by Jenny Smith. Review: If you think you know how to train your parent, then you're WRONG! An exciting new book that is funny and crazy by Jenny Smith is perfectly titled Diary of a Parent Trainer. A shocking twist comes into Katie Sutton's normal life when her mother starts dating a new man after her dad dies. Katie Sutton is just a normal teenager with two best friends, Hannah (who is also Katie's cousin), and Louise (whose nickname is Loops because she has long curly hair). Katie's family and friends live in a small town named Brindleton. Katie thinks she's a pro at operating grown-ups, but she begins to doubt herself once she can't ÒcontrolÓ her mom. But she blames Stuart, her mom's new boyfriend, because she claims that her mom has been acting differently ever since she started seeing Stuart. Katie and Mandy try to get rid of Stuart by doing many things he doesn't like and by trying to annoy him so he will break up with their mom. Katie tries to use her operating ÒskillsÓ to control her mom so she can get her to do something that Stuart won't like. But, will it work or will it make things worse? I really enjoyed reading Diary of a Parent Trainerand I couldn't wait to read what was going to happen next. It is a good book for girls that enjoy humor. I think the people who read this book should probably be 6th graders- 8th graders. There are a lot of good parts in the book, but one that I really like is when Hannah and Loops forgive Katie for betraying Loops. It is very emotional and really drew me into the book. Another part of the book I like is when two girls named Leanne and Shannon (Katie's other cousins that are very mean to her) started to torment her, as usual. Although Katie and her friends are outnumbered when this happens, more and more of Katie's friends come to defend her, until Katie's friends outnumber Leanne and Shannon's friends. This part of the story shows that your friends will always have your back and I really liked reading that part. In the end Katie learns that being a parent trainer is not as easy as she thought and she realizes that she is happiest when her mom is happy too. Review written by Lindsey (6th grade student). We would like to thank Random House for providing a copy of Diary of a Parent Trainer for this review. 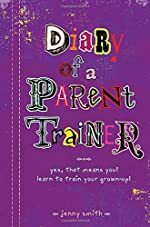 Have you read Diary of a Parent Trainer? How would you rate it? Diary writing is considered as a good habit for a simple person. In today's busy life many of us are not habitual of this process. Author with the help of such stories try to provide us the benefits of writing the diary.